ACCIDENT FREE. AWD, MOONROOF,PREMIUM LEATHER INTERIOR / WOODTRIM, ELECTRIC / HEATED AND VENTILATED FRONT SEATS, DRIVER’S AND PASSENGER MEMORY SEAT, AUTOMATIC DUAL ZONE CLIMATE CONTROL, PREMIUM LEXUS AUDIO AM / FM / 6 CD / DVD / MP3 / WMA / BLUETOOTH / INTEGRATED SATELLITE XM RADIO W/ 13 SPEAKERS, LEATHER WRAPPED / POWER TILT AND TELESCOPIC STEERING WHEEL W/ PADDLE SHIFTER / AUDIO CONTROL / BLUETOOTH AND CRUISE CONTROL, SMART KEY SYSTEM W/ PUSH START BUTTON, 17'' LEXUS ALLOY WHEELS, BI-XENON HID HEADLAMPS, FOG LIGHTS, RAIN SENSING WIPERS AND MORE!! LUXURY PACKAGE. 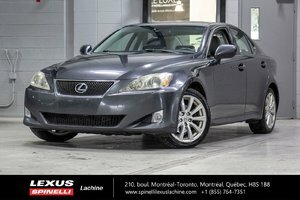 TRADE IN VEHICLE FROM A REGULAR GUEST OF SPINELLI LEXUS LACHINE. FOR MORE INFORMATION PLEASE CONTACT MARTIN OR JOSEPH AT 514-634-7177. Cylinders : 2.5L Engine at 304 hp / Torque 185 lb-ft - V6 cyl.